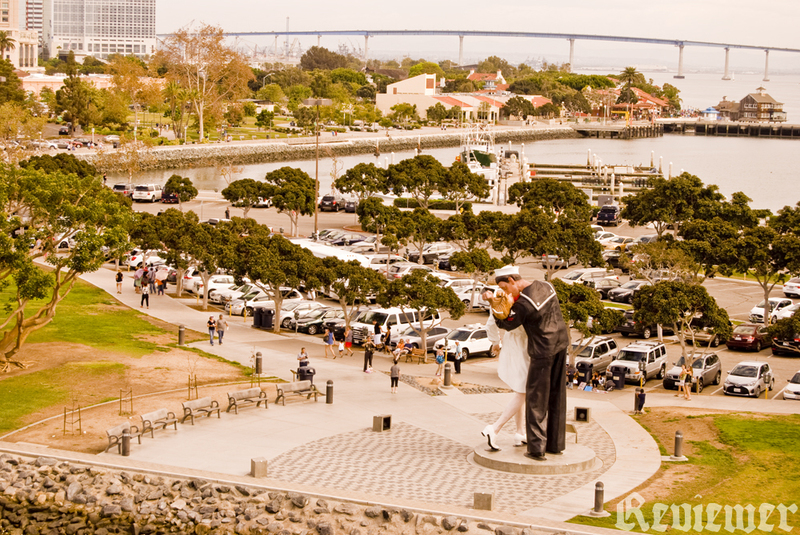 Unconditional Surrender, the sculpture, at San Diego Bay, between Seaport Village and the USS Midway. God, just look at that gargantuan monstrosity. Probably one of the worst public sculptures on display anywhere in the world, “Unconditional Surrender”, photographed by me from the deck of the USS Midway yesterday while shooting a job. Yes yes, I know we must appreciate the sentiment it’s supposed to portray, support the troops and all that. But as a work of art it fails miserably in what it was trying to achieve. You can tell the sculptor/artist was not attempting to emulate Picasso or Dali. He wasn’t going for abstraction or surrealism. He was trying for Norman Rockwell. He wanted realism, and he FAILED. The gesture in the sailor’s legs and the posture of the couple in the original photo he tastelessly ripped off is totally different from this blocky amateurish misrepresentation. It doesn’t honor the troops, it makes San Diego look like a kitchy border town pandering to the military dollar. If they want to make sailors on liberty feel welcome the city can bring back the Gaslamp stripclubs and the red light district. That would work better than this hollow image trying to echo an era almost no one today remembers. The scene was in Times Square anyways. But looks like New Yorkers are too smart to want it. Maybe if it had been scaled down to near lifesize, and bronze or grey concrete in color, it would be less offensive. Instead it’s this giant garish would-be carnival attraction/bird poop magnet. That’s our opinion. What’s yours?